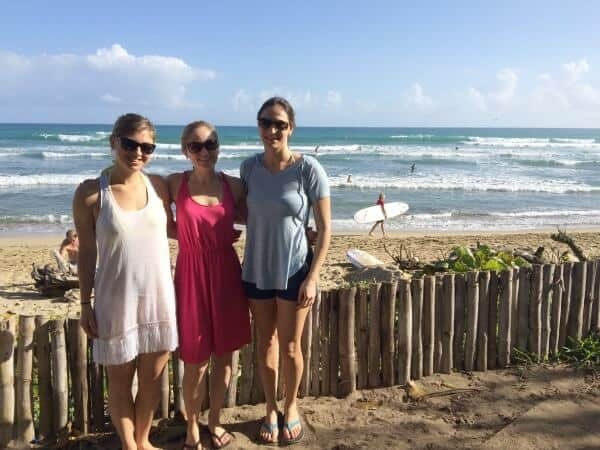 After talking about the food in the Dominican Republic a couple of weeks ago, I’m back to show you all the crazy fun adventure stuff we did in our 5 days there. For a quick recap, you can watch the video below for the highlights. The itinerary for this trip both excited and scared me when I saw it a few days before we left. I was excited about everything except surfing. Surfing has always scared the crap out of me for some reason. 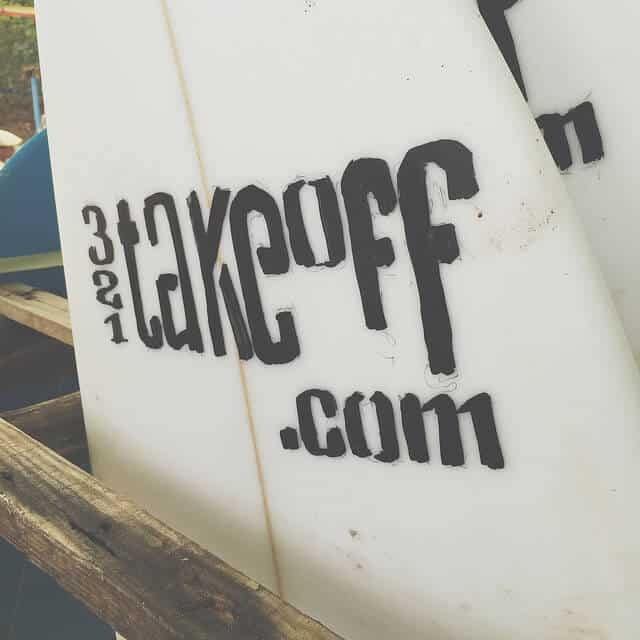 But, with the Master of the Ocean tournament wrapping up on our first day there, we got to both watch some of the best surfers in the world compete as well as try it out for ourselves at 321Takeoff in Cabarete. The surfing school is right on the beach and both the owner and instructors were incredibly knowledgeable while still maintaining that surfer “chillness” you’d expect. 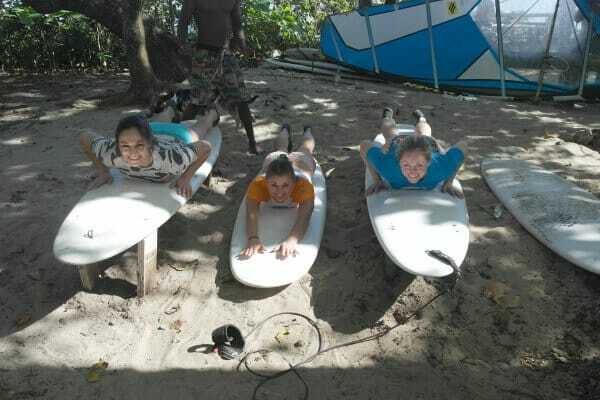 Anne, Sarah and I first got plenty of practice on some foam boards in the sand on how to make the transition from paddling to standing before we all headed out into the water. We paddled out, turned ourselves around and then with the instructors behind us giving us a little push as the wave came, we surfed our way back to shore for the next hour. It took me 2 or 3 tries before I finally stood up (and stayed up) but once you got the hang of it, it wasn’t nearly as bad as I thought it’d be. Granted, enough falls were taken that after about 60 minutes, I’d swallowed enough salt water to call it a day. I’m sure with real (not foam) boards and no one to push you as the wave comes, it’d be a whole lot harder but it was a great first experience nonetheless. Our instructor in the picture above surfed a wave in upside down on his head. No joke. The next day we headed to the Extreme Hotel. This place was crazy awesome. 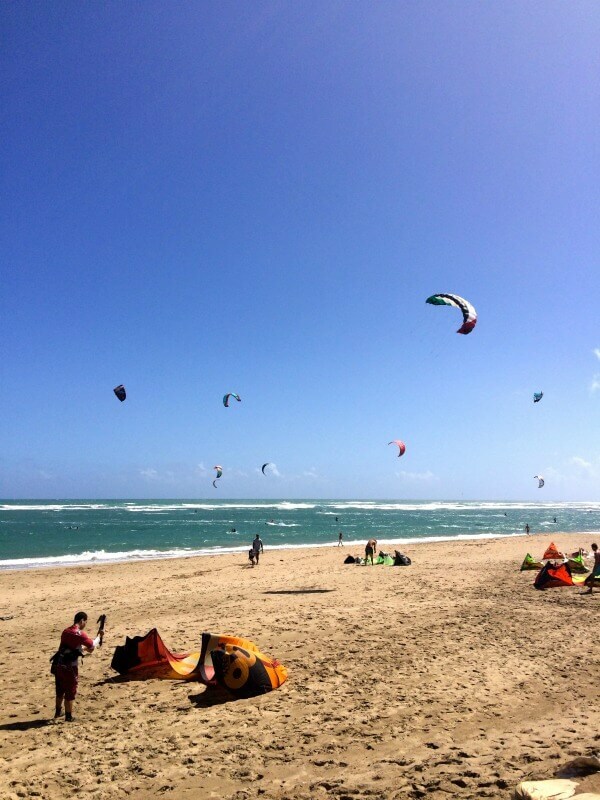 It’s right on the beach, offers a ton of activities like trapeze, kite-surfing, Crossfit style workouts, yoga and it’s really into sustainability. It’s powered by solar and grows a lot of it’s own food (for the onsite restaurant) through aquaponics. Anyway…back to 2015. The swinging itself is fine, it’s the walk up the ladder and standing on the platform that gets the adrenaline going. 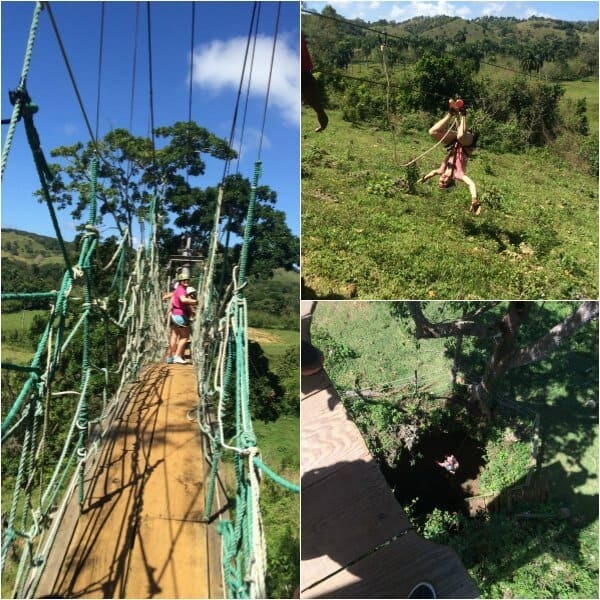 I literally came down after the first swing with that crazy feeling of nerves, excitement, fear and shakiness coursing through every vein in my body…aka: adrenaline. 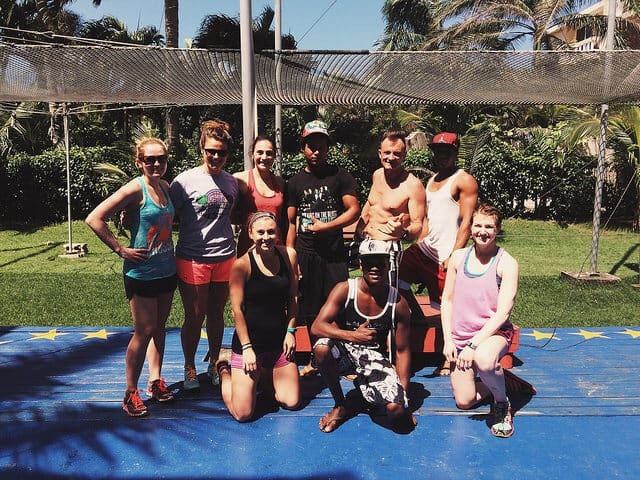 Check out the video above (at 1:50) for clip of the trapeze! 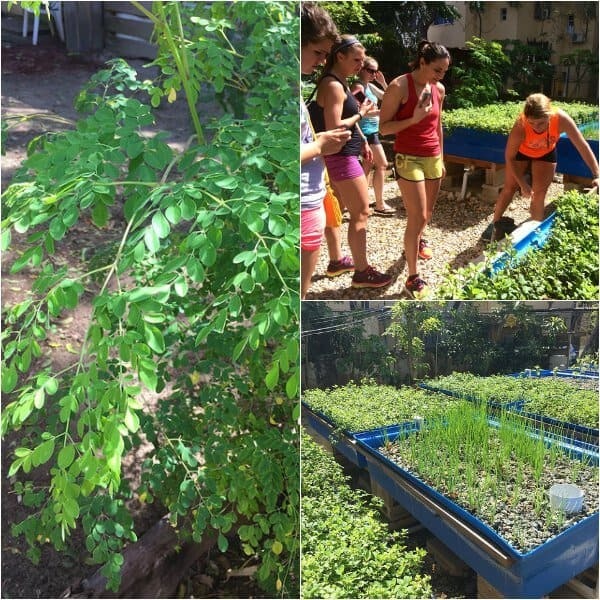 We got a quick walk through of the aquaponics area including a little lesson on that plant on the left called moringa. Apparently, it’s a superfood plant that grows everywhere in the country. It’s high in protein, vitamins A, B and C and used in lots of drinks locally. It tasted completely different than I thought it would, kind of peppery almost! 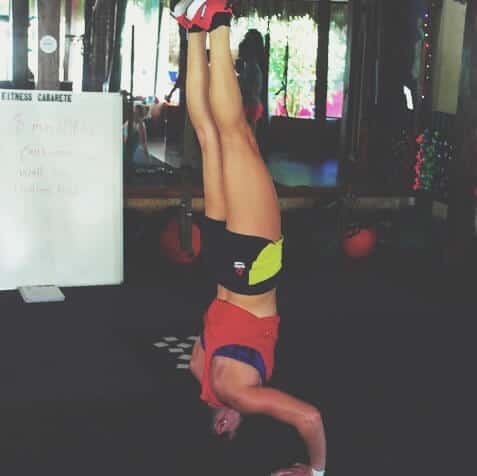 Sarah put together a great video of the workout if you want to try it out yourself! I did the renegade rows on 10 pound dumbbells which I also used for the side plank raises. I chose to do the squat cleans at 65# instead of goblet squats and the whole thing took us all about 30 minutes. 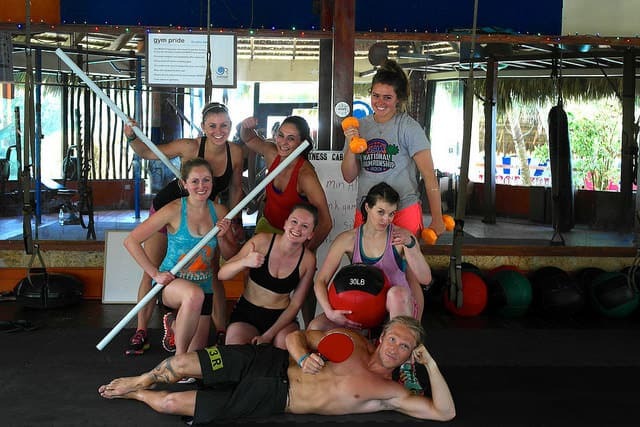 We were totally wiped out after that but of course we stuck around and ended up playing around with headstands and shoulder mobility drills after because we’re all fitness nerds like that. 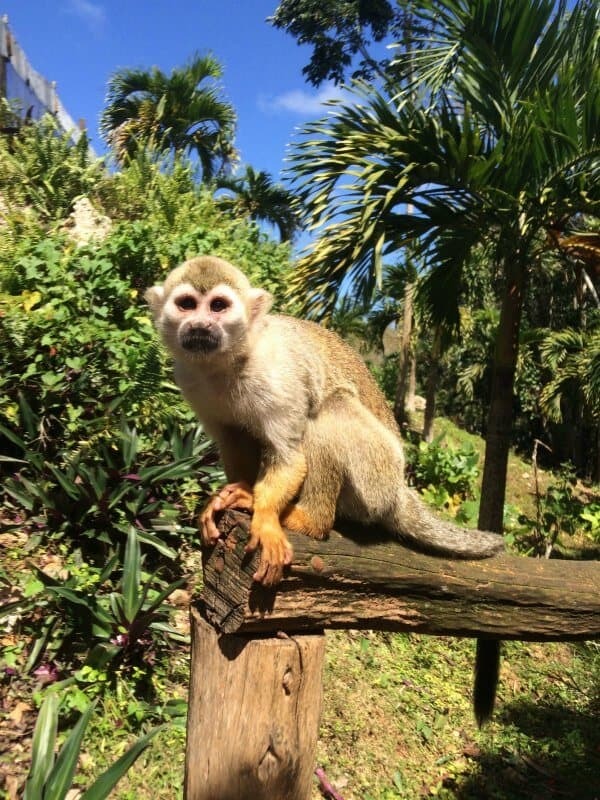 Our next adventure was a day of monkeys and ziplining. Two odd things to combine but both totally fun! 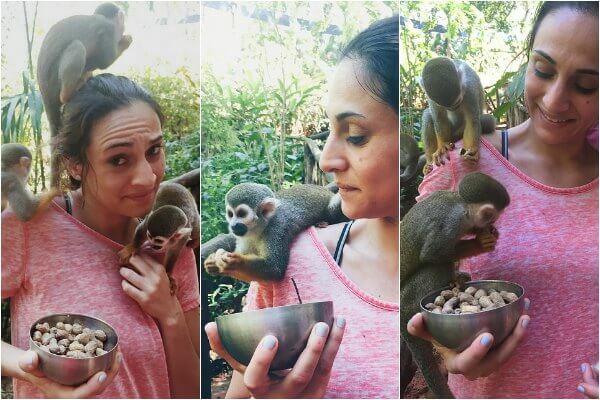 Monkey Jungle is literally back in the middle of nowhere but after a 20 minute nausea inducing bus ride, we arrived. The cool thing about this place is that part of the money raised from the tourism goes to help fund a dental and medical clinic for locals who can’t otherwise afford that kind of care. The monkeys…ok, these guys totally freaked me out at first (as evidenced by the video at 0:22). Although, the screeching you hear in the video is actually Anne freaking out while videoing me because she was freaking out herself! After awhile I got used to them crawling all over me until one got stuck in my shirt. I had on a shirt with a criss-cross back and the thing couldn’t get out after crawling down there. Commence freak out. The zipline portion was awesome. I’ve been ziplining a bunch of times and really love it. 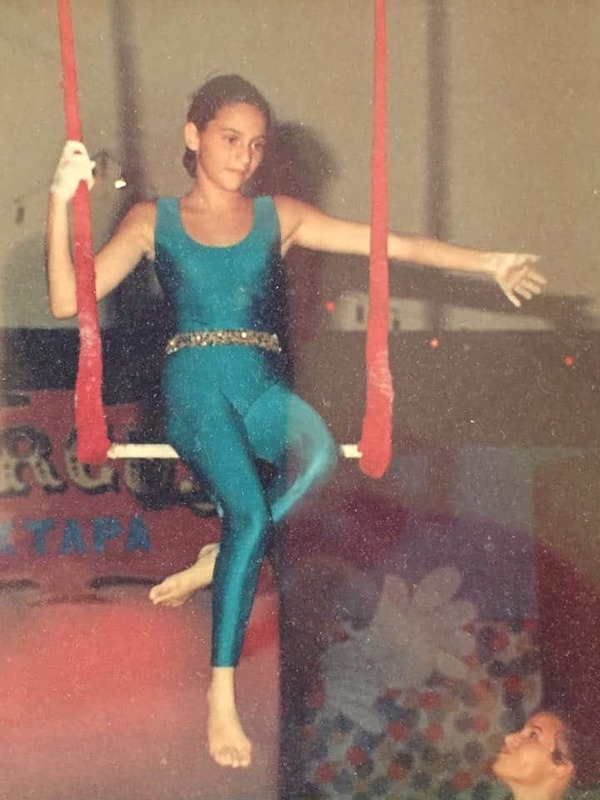 You’d think it’d be an adrenaline rush like the trapeze but it’s really not. This course had a cool feature where we ziplined straight down into a bat cave as one of the runs. Totally different than anything I’ve ever done and while it was a little weird to just jump off the platform and go straight down, it wasn’t nearly as scary as you’d think. They even let those of us who wanted to go upside down on the last line of the course which I definitely took advantage of! 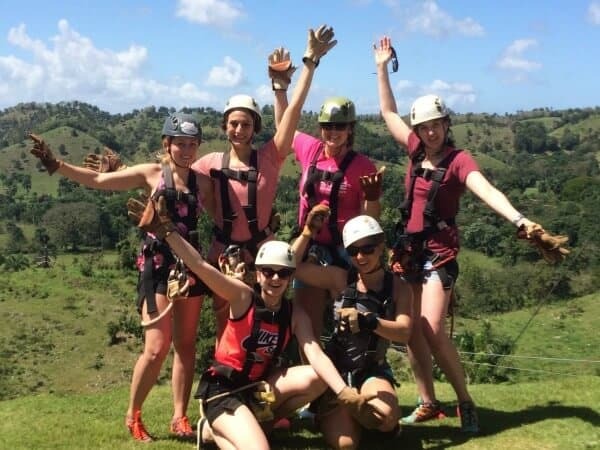 On our final day we headed out to Iguana Mama for a day of canyoning, repelling, cliff jumping, swimming and hiking. It was like a natural version of a waterpark! We did the Magic Mushroom trip named for the rock formation below which looks exactly like a mushroom. 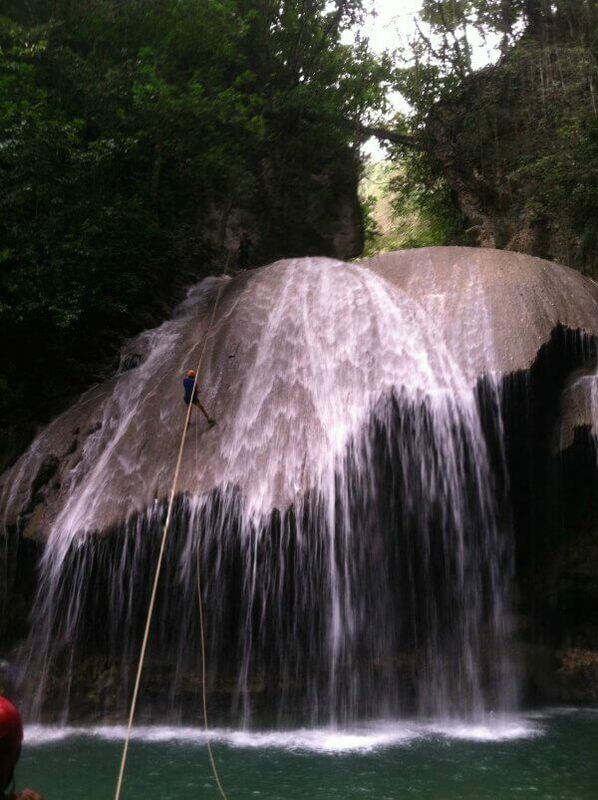 We actually repelled down that rock until it ended and then ziplined into the water. The weather wasn’t so great while we were there, going back and forth between clouds and rain so it was a bit cold at times but still SO much fun. The cliff jumping was definitely the craziest part. We all did the first 10 foot jump but the next one we came to was 50 feet and we all opted to repel down that instead of jump (I honestly think someone would’ve gotten seriously injured jumping that!). 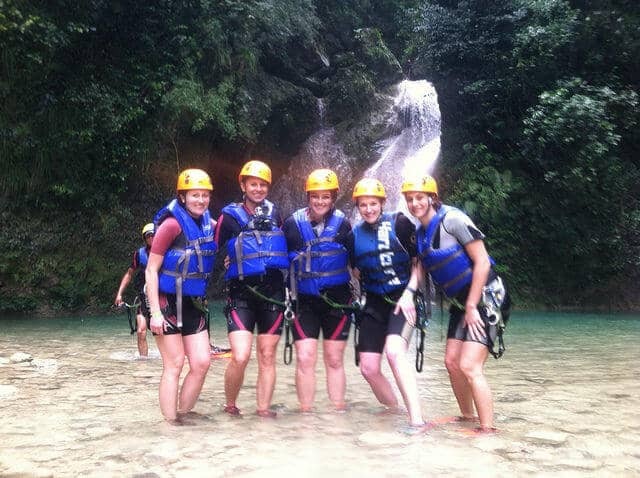 The last jump was 25 feet and while pretty high/scary, we all jumped it as our last hurrah in the water before hiking back up to the top which was crazy steep and quite the workout when you’re wearing a wet suit, life jacket and helmet with water logged shoes. A BIG thank you to the Dominican Republic Ministry of Tourism, Annie and AJ for inviting me along on this trip and covering all the expenses. So many cool things to do! 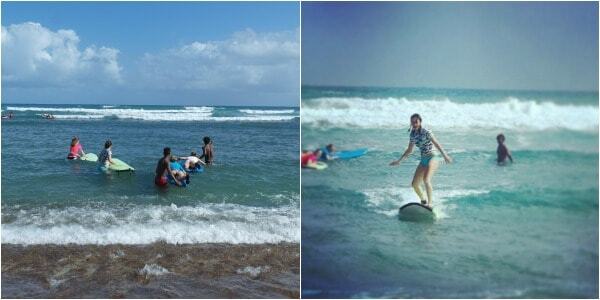 The surfing looks like it was a blast–I’d love to try that someday! Trapeze is in style right now!! We have a studio near us that offers classes for kids! I want to go back!! Love the video – especially the part where I freak out. ;) Lol!